As long as it is turned on, your mobile phone registers its position with cell towers every few minutes, whether the phone is being used or not. Since mobile carriers are retaining location data on their customers, government officials can learn a tremendous amount of detailed personal information about you by accessing your location history from your cell phone company, ranging from which friends you’re seeing to where you go to the doctor to how often you go to church. The Justice Department and most local police forces can get months’ worth of this information, without you ever knowing – and often without a warrant from a judge. It’s not just your location that can be tracked by law enforcement, but your use of data too. Mattel wants to get in on this “spying” action with its new Barbie doll. 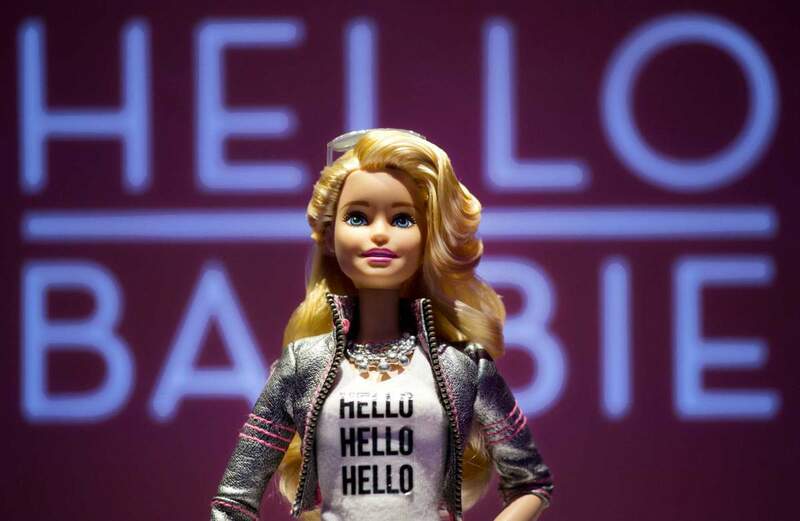 Due out in the fall of 2015, the Hello Barbie will record your child’s voice then send the data to the company. The information will be used for marketing. Imagine your children playing with a Wi-Fi-connected doll that records their conversations–and then transmits them to a corporation which analyzes every word to learn “all of [the child’s] likes and dislikes.” That’s exactly what Mattel’s eavesdropping “Hello Barbie” will do if it is released this fall, as planned. But we can stop it! Kids using “Hello Barbie”‘ won’t only be talking to a doll, they’ll be talking directly to a toy conglomerate whose only interest in them is financial. It’s creepy—and creates a host of dangers for children and families. Children naturally reveal a lot about themselves when they play. In Mattel’s demo, Barbie asks many questions that encourage kids to share information about their interests, their families, and more—information advertisers can use to market unfairly to children. Mattel has been in trouble lately. For the third year in a row, Barbie sales are down. The company is scrambling to revive Barbie, as the market has changed to reflect kids growing up faster and the appeal of movie character dolls. Mattel needs the data of your little girl’s thoughts and feelings to figure out how to increase profits. The company doesn’t care about your child’s privacy. Unveiled last month, Hello Barbie is a clever toy with a little bit of an oversharing problem. With a microphone, Hello Barbie can listen to what children tell it. With a computer and a Wi-Fi connection, Hello Barbie can take those words, encrypt them, and then send them over the internet to a cloud server where voice recognition software listens to the recording and then picks a reply for Hello Barbie to send back. Only there’s a minor hitch: it might be illegal to record children and then store that information elsewhere. The Children’s Online Privacy Protection Act, which became law in April 2000, sets out strict rules for obtaining information from minors online. These rules prohibit the collection of information from children under the age of 13 unless there is parental consent, plus a way for the parents to find out what information was collected and then obtain that information, or unless the information is used to respond to the child as a one-off and isn’t stored in a retrievable way. It is bad enough that adult technology has taken away our privacy, but to design toys that do the same simply to increase profits is abominable. I’m sure glad none of my grandchildren – male or female – play with these things! Barbie has come a Long Way from being the cute doll she started out as. Some teachers used to send out notes at the beginning of the year that said, “If you don’t believe everything your child says about school, we promise to not believe everything your child says about home.” Why? Because kids have not developed the protective family solidarity instincts of older children and adults. They say whatever they’re thinking and add to it whatever sounds like fun, which is why companies such as facebook have those “you-must-be-13-or-older-to-have-an-account” statements (and we all know how kids get around that!). I’ve had kids tell me the most outrageous lies about every facet of their lives. Sure, we all want to protect exploited, abused children and wish that they had told a helpful adult before it was too late, but that is not the issue here. This is all about continuing the endless march toward forfeiting our privacy, step by step and word by word. If we give it away, we don’t deserve to have it and we get exactly what is coming to us! No Barbies for our house, thank you! i think as a parent it should be my choce weather i get the doll for my kids or not. if i know what it will do and i don`t like that then don`t buy it just leave it on the shelve. There is people out there that do keep them for them self to put with all of the ones they have had all there lives. This doll will add to it just like the one that was a tatoo with a butterfly on the belly and then there was the one with the one that went with the internet . There has not been any thing said about that doll ant more.